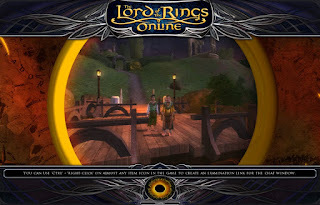 As I briefly noted earlier, I've started casually playing through The Lord of the Rings Online and found it a surprisingly relaxing, fun experience. Not too much to report, but I figured I'd share a couple of observations. Fantastic sense of place. It feels like you're "really" in Middle-earth. Rather good writing. There's only so much you can do when your game design requires you to have thousands of quests, leading to endless variations on "Kill 10 Crebain!" and "Collect 20 wild mushrooms! ", but they're presented in a way that contributes to the overall narrative ("The enemy has sent birds to spy on the path taken by Frodo!") and setting ("With the threat of war in the south, we need to make sure Bree has enough food stockpiled to survive the disruption of trade and farming! "), and the writing itself is solid... not too goofy, not too dark, nicely congruent with the feel of Tolkien's voice. Terrific customization options. It probably says a lot that, thus far, the time I've most been tempted to spend money on the game was to buy a particularly pretty cloak (sky-blue with Telperion woven in silver threads on the back). And I love how you can present yourself with one outfit while gaining the gameplay benefits of another. Wonderful music. It's thematically rich and varied, catching my interest and never outstaying its welcome. Best of all, it seems to be tied to your current region, so I expect I'll continue to hear new music throughout the course of the game. Well-sized content. I imagine this will change as I progress, but at this point, I feel like I can make good use of whatever time I feel like spending in the game: just a few local quests if I'm hopping on for a quick half-hour before bed, or an entire chain of events and instances if I have a couple of hours to play on the weekend. The integration with the canonical story is surprisingly well-done. I was kind of dreading meeting Aragorn and Gandalf and other major characters, but so far it has blended in quite well, both in terms of the books' timeline and the representation of the characters. The economy seems out of whack. I think it's a by-product of them trying to hurry new players through areas where they used to spend a lot of time, but it feels really weird that I earn, say, 80 copper pieces for finishing a quest, and 400 silver pieces for opening a Hobbit gift. Thanks to the rapid progression in RPGs, though, it's not that big of a factor... I'll quickly outlevel any new equipment anyways, so the only thing I'm expecting to spend any money on soon is housing and cosmetic outfits. Combat is... fine. I dunno. I hit three keys and every enemy dies before it reaches me. Again, this is probably due to rebalancing, and I'm sure it gets tougher at higher levels; hopefully it also gets more interesting, because at the moment, there's no reason for me to use 80% of my skills. Crafting. Right now, the main issue is just that you outlevel your gear so quickly that there's really no reason to spend time and effort making new items. I imagine it becomes more useful once your progress curve slows. They made an interesting design choice that requires cooperation across multiple professions in order to craft most items (e.g., if you're a weaponsmith, you'll need materials from a metalworker); if I get into this, I imagine that I'll need to hit up the auction house semi-regularly in order to make the stuff I want. Voice acting is really minimal. It reminds me a lot of the Baldur's Gate era: you'll get a short voiced phrase that accompanies two paragraphs of written text. It isn't bad, as such, but that sort of in-between state feels weird these days; I'm much more used to games either going full-text and letting your imagination color them in, or fully voicing them for maximum impact. The sheer proliferation of currencies is absurd. Three types of specie (copper, silver, gold), mithril coins, turbine points, various types of marks, medallions, tokens, barter items, badges, and more. I hate it. Each merchant only accepts a particular type of currency, and I have no idea how I'm supposed to earn most of them, or what I can do with some of the ones I have. It's to be expected in a free-to-play game, but it's aggravating to see the developers intentionally cripple aspects of the game to make it painful for people who haven't spent money. The most obvious is the limit on currency (2 gold coins), which leads to a UI nag every time you loot any money or sell an item. I vastly prefer Failbetter's F2P philosophy, which is essentially "Provide a great and complete experience to all players, and offer to sell more and newer experiences to players who want more." And, given that there is a store, it's bafflingly hard to use. I spent an inordinate amount of time trying to figure out how to get into the store from the lotro.com website, only to finally realize that it's impossible. You can only browse and purchase from the in-game browser, which has an awful, janky, ugly interface. All I want to do is browse through it on my desktop browser, where I can actually read about stuff and compare items and complete purchases. Overall model and texture quality is rather low. It's mostly a factor of how old the game is, and I'm amazed that the environment itself holds up so well. This is a rather unfair complaint, but I'm a bit bored by the lack of choice in quests. I've been trying to instead focus on the choices available to you as a character: which quests to accept or decline, where to go, how to spend your time. Still, my time with Star Wars: The Old Republic spoiled me for having interesting, engaging, branching storylines in my massively multiplayer roleplaying game, and it's increasingly hard for RPGs to keep my interest without offering a similar degree of agency over how the plot develops. As you will not be shocked to learn, I've been taking some screenshots of my experiences and assembled them into an album. It's pretty interesting to look through... a mixture of gorgeous settings and badly dated graphics. We'll see where things go from here. I'm up to level 19, pretty significantly overleveled for the content I'm currently doing in Bree; as with currency, it feels like Turbine has shifted the XP curve to hurry people along to later content, but that does mean that if you try to actually do everything in the game, you end up getting no meaningful rewards from the quests. Anyways, I'll wrap up the stuff in the Old Forest and Barrow Downs, along with any other Ranger business, then head on into the Lone Lands. I'm on a trajectory for reaching level 30 before terribly much longer, at which point I'll make the call whether to start spending money on the game or not. So far, the pleasures of adventuring in Middle-earth have outweighed the pains of playing a somewhat dated free-to-play game, so I won't be shocked if I stick a quarter into the machine to keep playing a while longer. 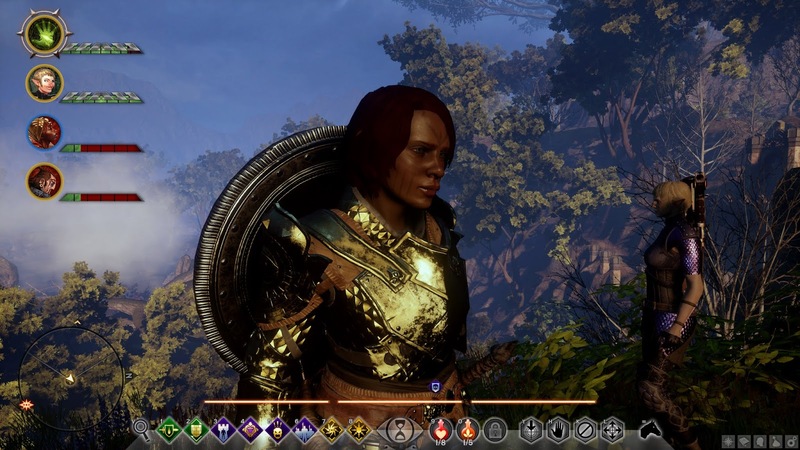 Dragon Age: Inquisition is holding up as one of my favorite games, of ever. Its first expansion, Jaws of Hakkon, provided a great excuse to dive back into the world. There is still plenty that I haven’t done in the main game yet - the Hissing Wastes remain largely unexplored, along with most of the Emerald Graves and some other locations - but the prospect of additional storylines prompted me to pony up for the DLC. BioWare has gotten really great at putting together DLC recently; in particular, the expansions for Dragon Age 2 and Mass Effect 3 did a fantastic job at responding to specific criticisms that players had about the main games, and in many respects surpassed them. I believe this is mostly due to BioWare’s surprising humility in listening to and responding to their fans, as they seem to be very in tune with the cultural pulse around what aspects people enjoy, dislike, and want more of. JoH doesn’t provide as dramatic a sense of improvement, but I think that’s mostly because Inquisition is such a great game to begin with. It’s more about giving us stuff that we already like than fixing anything fundamentally broken in the game. (Though the latter is arguably accomplished thanks to the Black Emporium, a free update distributed separately from the DLC, which finally lets players fix visual blemishes in their characters.) 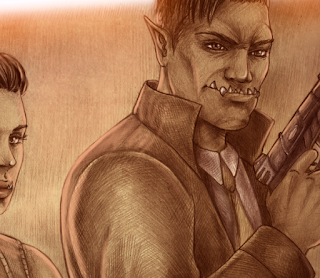 We get to banter more with Scout Harding and learn about her history, elevating this fan-favorite character from a minor source of exposition to a supporting sidekick. There’s also a lot of new banter between companions: not even tied in to the new story, just further developments in their funny, fraught relationships. And, on the flip side, BioWare has omitted some of the aspects of the game that people didn’t particularly enjoy; most noticeably, there are no new requisition orders from your camps. 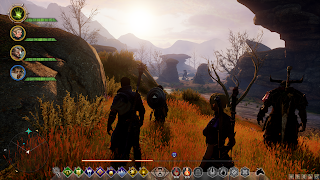 For better and worse, JoH feels like a big new area in Inquisition rather than a sequel to Inquisition. You have the same freedom of exploration, gorgeous new vistas to see, cultures to learn about, side-quests that range from the rote to the fascinating. I’ve been impressed by the work BioWare went to in making this content available at various points during the game: much like the Dragon Age 2 DLC, you can play it at nearly any point, including after the end of the game, and the dialogue within it will be updated to reflect your current status. I happily played it in my post-end-game Aztar Cadash save, and was satisfied with the occasional recognition of the massive feats I had already accomplished. At the same time, the plot in JoH feels sufficiently weighty to be worth my Inquisitor’s time. There’s a bunch of great lore in the game. A lot has to do with the Avvar, who have been present since Origins but, thanks in part to the discarded Human Commoner origin story, haven’t really been explored to the same extent as many other ethnic groups. 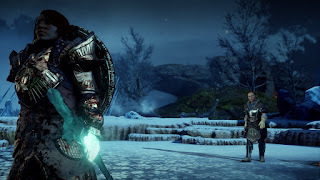 As is so often the case in Dragon Age, we see that they aren’t a single monolithic entity, but a dispersed and varied culture with conflicting leaders, perspectives, and agendas. On the whole, they have a strong Nordic feel about them, reminiscent of the Wildlings in Game of Thrones / A Song of Ice and Fire, as well as the Nords of Skyrim. It doesn’t directly play into the plot much, but one thematic plot thread that I particularly enjoyed had to do with the Avvar’s reaction to the “modern” world. 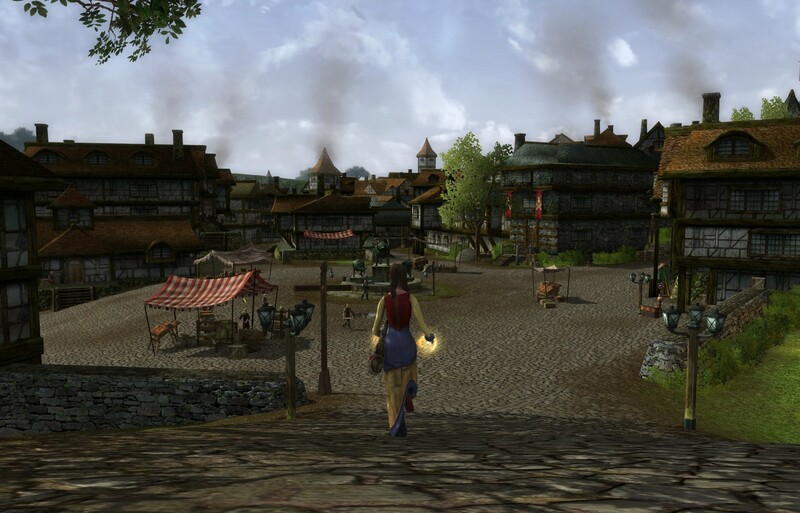 You spend some time in Stone-Bear Hold, a mostly-peaceful settlement. Their leader, Sun-Hair, is really quite progressive: she wishes to trade more with the “lowlanders”, and has little use for the more violent tendencies of the Jaws of Hakkon. One of my favorite parts was when you find some notes where she was practicing a letter to the Orlesians inviting them to trade: there’s a wonderful mix of pride in her culture, frustration at the limits of her literacy, embarrassment at how she will be perceived, hopefulness for the ways this exchange could improve the lives of her people. I was strongly reminded of the perennial dilemma faced by indigenous people confronted with an outside culture, as they try to strike a balance between holding on to the traditions which have sustained them for generations and the advantages offered by joining the global monoculture. The deep lore in the game, though, has to do with the history of the Inquisition. We’ve learned a lot about this over the course of the main game: how it was originally a separate faction, devoted to stamping out the threat of mage abominations, and relatively late in joining the Chantry to present a unified force against the Blight. We get some impressive lore bombs here, of which the biggest might be that the old Inquisition was led by an elf, who was also a personal friend of Emperor Drakon. 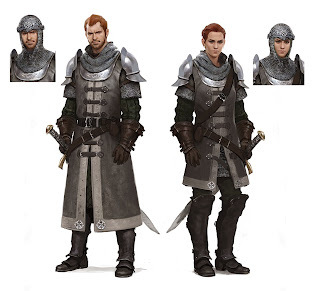 We already know that, around the time of the Exalted March on the Dales, the Chantry hierarchy purged most references to elves from the canon, removing persons such as Andraste’s disciple Shar’tan. That same effort was successful in wiping the record of elven involvement from the founding narrative of the Orlesian Chantry. Anyways. 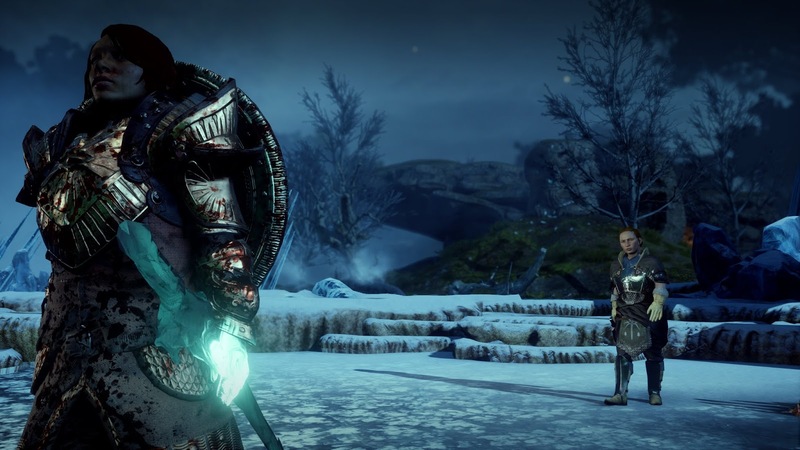 As usual, Dragon Age does a fantastic job at evoking real-world scenarios; it’s hard to hear this story and not think of events like the establishment of the biblical canon. There isn’t a one-to-one correlation, and the game isn’t meant to be an allegory or anything, but it certainly adds to the game’s great strengths at feeling complex, messy, and real. As has become rote, I took a whole bunch of screenshots of my time in the expansion and uploaded them into an album. Some of them are very pretty! Others are silly. Many contain spoilers. On the whole, I'm really digging BioWare's approach to DLC. In contrast to the long run-up to Inquisition, with frequent tantalizing glimpses at the upcoming game, they've been very tight-lipped about further releases for Inquisition, not announcing JoH until right before it went on sale. Of course, this also means that the next expansion could drop at any time, and after this experience, I'm even more eager to pick up what comes next. Hey, let's do another media round-up! I was just about to cancel Netflix when my friend Dan recommended I check out Danger 5. So, I did. It's easily the most bizarre show I've seen in a while, and, not coincidentally, I absolutely loved it. It brings to mind the deranged sensibility of Garth Merenghi's Darkplace in the way it glorifies intentionally bad art. It starts out weird, and gets even more deeply strange throughout the first season, before taking a very dark (but still hilarious) turn in the heavily re-imagined second season. So, that was a... very memorable note on which to end my Netflix subscription. Instead, I am now a happy subscriber to HBO Now. It's pretty fantastic. I'm reminded in a lot of ways of the revolution in digital music a little over a decade ago, which Apple also led. Up until that point, it was far easier to pirate music than to buy it; after iTunes came out, even people who knew how to pirate music were often happy enough to just pay a few bucks for the songs they wanted, since it was more convenient. That's very much how I feel about HBO Now: sure, you could just download Game of Thrones (and plenty of people do); but with Now, you can actually start watching it before the episode finished airing, and see it in high-definition without fiddling around with torrents or newsgroups or anything. Of course, it's not just Game of Thrones. Considering it's twice as expensive as Netflix, it had better not be! I've been really digging the second season of Silicon Valley, which once again is an uncanny reflection of my real life. And I've also been plowing through a bunch of the movies they have. I think that Netflix technically has more movies than Now, but Now, has way more movies that I actually want to watch. So far I've seen a bunch of flicks that I never caught in the theater, like Edge of Tomorrow, The World's End, Gravity, The Darjeeling Limited, The Interpreter, and King Kong, along with some old favorites like Dark City. At first, I was kind of anxious about watching movies before they expired (movies rotate on and off every couple of months), carefully tracking their expiration dates and watching them in order, before finally realizing that this isn't Netflix and there are more than enough good movies that I want to watch, so I don't have to ration them. But, perhaps unsurprisingly, most of my time on Now has actually been spent re-watching an old TV show: namely, The Wire. The re-watch has confirmed its status as my favorite TV show. I'm currently approaching the end of the third season, which is especially resonant given the awful events in Baltimore recently. Major Colvin is a clear stand-in for David Simon's philosophy, and gets many monologues throughout the season that perfectly capture Simon's understanding of the history of policing in Baltimore. But, of course, this is all in a show more than a decade ago, which makes it all the more painful to watch now... it feels like everyone knows that the current system isn't working, but everyone has kept doing the same thing anyways. I've been dreading the thought of watching the fourth season; it's probably the best, but is also incredibly painful, and will probably feel doubly so now given the real-world parallels. (During the opening credits of the third season, there's a brief shot of a wall covered in graffiti that reads "Body-more Murdaland." My heart aches whenever I see it.) So, I'm considering jumping directly from the season 3 finale to the season 5 finale, which is one of the best endings to any show ever. Oh: it might be worth noting that this is my first time watching The Wire in high-definition and widescreen. It's been many years since my last viewing, so it's hard for me to give a detailed comparison, but I will note that I really love it. Apparently the first three seasons were shot in widescreen, so it makes sense that they would be fairly adaptable to the format. Also, I liked the second season a lot more the second time around. I think it's because during my first viewing I saw it as a distraction from the unresolved storylines of the first season; now that I understand the show's purpose and rhythm, though, it holds up much better. On the gaming front, I just started playing Jaws of Hakkon, the first paid DLC for Dragon Age: Inquisition. The fan reception was a bit muted, so I didn't grab it at first, but now that I've started playing it I'm enjoying it. 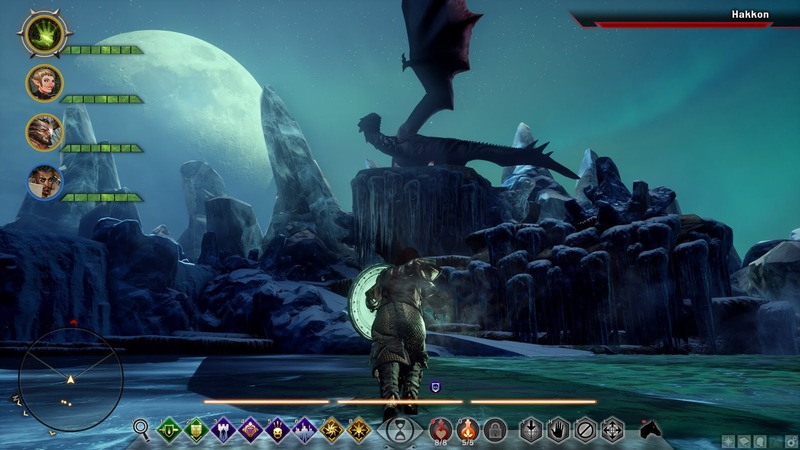 It helps that the base game has received some very welcome updates, most notably some major improvements to the keyboard-and-mouse controls and the return of the Black Emporium from Dragon Age 2. Thanks to the latter, I can finally fix my first Inquisitor's too-shiny lips. That... that probably sounds petty, but to me, it's much more important than a new sword or spell would be. Anyways - I'm sure I'll write up a full post later, but for now I'll note that the new areas are gorgeous, the combat is much harder than before, and there's lots of top-tier items and crafting resources to be found. I'm following my standard process and doing absolutely everything except for the main plot as long as possible, so I can't speak to that part just yet. I do appreciate that they allow it to be played either before or after beating the main game, which BioWare has done to good effect in the past with DLCs like Lair of the Shadow Broker. 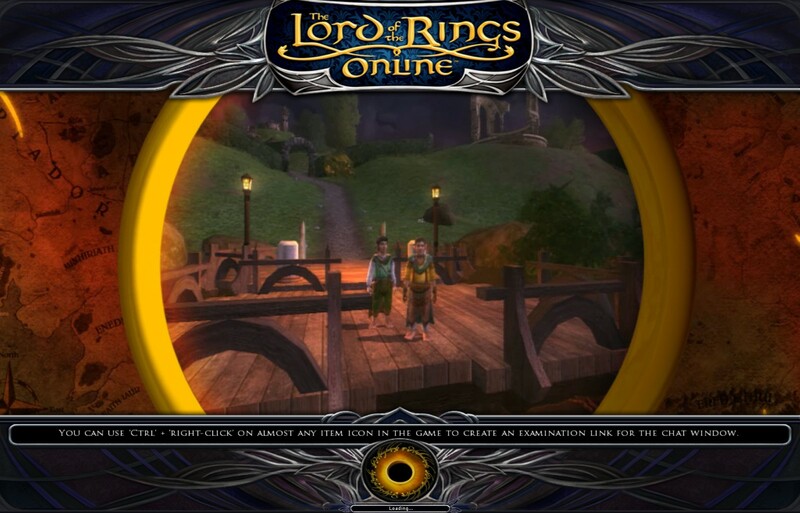 And, I should probably also confess my secret shame: for reasons that are still unclear to me, I recently installed and started playing Lord of the Rings Online. I'm really not sure why! I'm famously hostile towards MMOs, even more famously hostile towards free-to-play games, and supremely skeptical towards video games based on Tolkien's writings. I think the thing that caught my attention was some character art from the game which really struck me... it has a wonderful aesthetic that isn't hyper-stylized like many Asian fantasy games, but also isn't the sort of grimy "realistic" mode preferred by many Western RPGs. It's human, attractive, kind of modest but not bashful, if that makes sense. I've been poking away at it for a bit and am not sure if I'll stick with it. As usual, I appreciate the technical and creative concepts behind MMOs far more than I enjoy the experience of actually playing it. 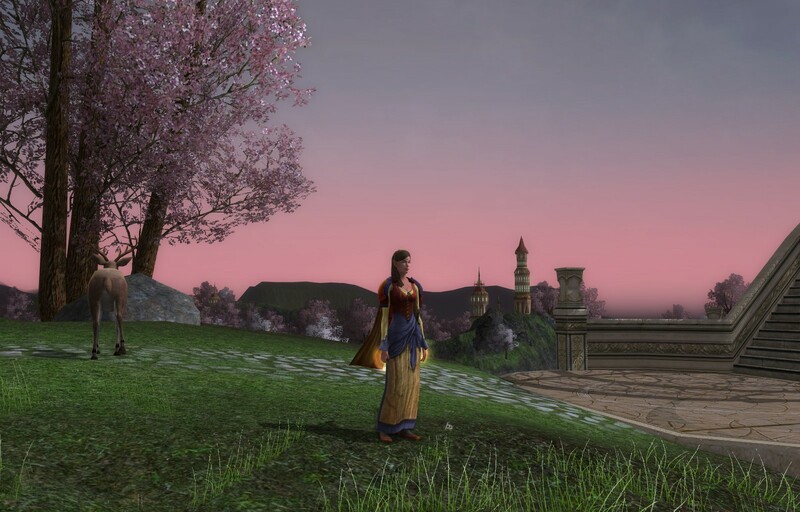 In the case of LOTRO, I've so far been pretty impressed at how lore-friendly Turbine has been in creating it. 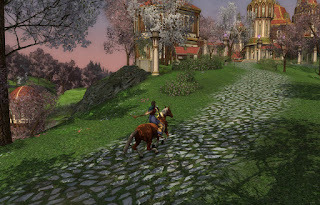 It's definitely not another WOW clone or gimmicky attempt to break into the market: it feels suffused by Tolkien's ethos, not just in the names and stories, but the flavor and values and overall feel of it. 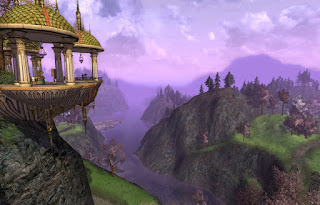 Most modern MMOs are all about getting as many points in a Skinner box as possible, as you are rapidly trained to perform actions in exchange for rewards. In LOTRO, the most overwhelming sensation I've felt so far is a love for Middle-earth. Yes, there are quests and fights and such, but the whole tenor of the game is very conducive to wandering the landscape, listening to music, reading and learning. All players are on the same "side," defending the Free Peoples against Sauron's threat, and are unabashedly "good". Your characters have stats like Will and Fate, but also can gain virtues like Determination, Patience, Fidelity, Innocence, Tolerance, and Mercy. I mean, seriously, how many RPGs let you gain levels in Innocence?! The game is pretty ancient, having just passed its eight birthday. For reference, that's two and a half years before Dragon Age: Origins came out. Considering that, I'm absolutely astonished at how good it looks. I'm pretty sure that's mostly thanks to the art direction - it certainly doesn't challenge my graphics hardware at all, even with settings maxed. But thanks to the fantastic use of color palettes and... well, just making pretty environments, it's very easy to look at. Most of all, I've just been enjoying the feeling of being "in" Middle-earth. That's a sensation that I've craved for most of my life. As a kid, I would daydream frequently about living a life in whatever fantasy land currently had my attention: as Lone Wolf in Magnamund, or a Ranger in Middle-earth, or a traveler in Midkemia. I vaguely thought that, if I could somehow experience being in those worlds, I would be perfectly happy to just maintain that experience forever. I would fantasize about wandering through the forests that I'd read about, climbing the watchtowers, sitting on the shores. My fantasies weren't about killing enemies or gaining glory: just being there. Looking back, it does make a certain amount of sense. Kids are impressionable, and those books certainly made an impression on me. Also, there were aspects of my life that I didn't like back then, so it's almost logical that I would prefer to live another life. All that said, it's kind of funny that I still can feel that kind of yearning sometimes. My life today is fantastic, and I wouldn't want to give up the real world for anything... but somehow, the thought of vicariously living in Middle-earth continues to command my attention. Like I said before, we'll see how long this experiment lasts. I'm currently playing as an elven minstrel named Taharien. In keeping with the lore-friendly design of the game, there aren't any mages or clerics or paladins. The minstrel class is inspired by Luthien from the Lay of Beren and Luthien, although it can be selected by all genders and races. The mechanics are interesting and a lot of fun, and involve aspects of dissonance, resonance, and harmony; skills include ballads, anthems, and codas. I've also taken on the Explorer vocation, which includes Prospecting, Forestry, and Tailoring professions. There's a lot to like, including terrific support for cosmetic wardrobes - you can dye clothing into the color you want, can hide individual pieces of armor based on preference, can support multiple wardrobes, and can even visibly wear one outfit whose appearance you like while gaining the stats from another outfit. That's something BioWare could take notes from! I imagine that the F2P mechanics will annoy me at some point... I'm currently at level 12, and it sounds like it starts getting hard to advance without paying around level 30 or so. I've done some advance research and have a rough plan for how I'll spend money if I do decide to spend money. I figure I'll give Turbine the same opportunity I gave Failbetter: play all of the freely available content for as long as I can, and if I feel like I owe them money by the end of that time, start showing my appreciation with my hard-earned cash. Hm... there's probably more to write but that will do for now. Time to watch Game of Thrones! Thanks as usual to the immensely talented Isbjorg!